One-quarter of the Black Hippy collective - alongside Kendrick Lamar, Ab-Soul and Jay Rock - ScHoolboy Q has already proven that he has an impressive ear for talent through early collaborations with the likes of A$AP Rocky, Jhené Aiko and BJ The Chicago Kid, through to heavyweight features on his latest LP from Kanye West, Jadakiss, Anderson .Paak and Miguel. Following on from Top Dawg Ent’s massive 30-date ‘Championship Tour’ across the US and Canada with Kendrick Lamar, SZA, Jay Rock, Ab-Soul, SiR and Lance Skiiiwalker, TDE’s grooviest set his eyes firmly on London for a very special show on Thursday 27th September. Teaming up with Vans to find new talent to join him on stage as part of their ‘Share The Stage’ campaign, we hosted a contest of epic propoertions calling out for the finest musicians to submit a song for judging by Q himself. A talented winner has now been selected from the host of entries. 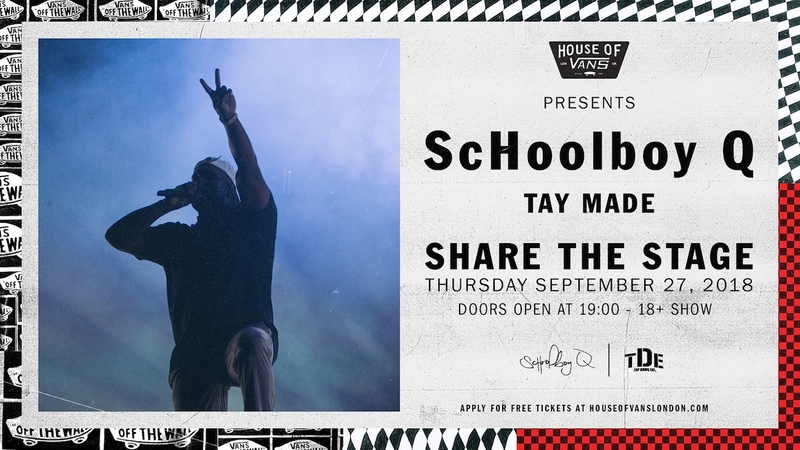 Drum roll please... South Londoner Tay Made, part of UK collective 'Stupid Mad Fresh' was personally selected by Q from over 300 submissions from across Europe - to perform alongside the main man as support act on the 27th of September at London's finest skate park, House Of Vans. Tickets to the concert are free, we repeat free. To sign up for yourself and a friend to attend simply enter the ballot now over on the House Of Vans website. You have until 18:00 (BST) on Sunday 23rd September to enter to secure your spot - so go get busy!